Printed in 1776, on the cusp of the American Revolutionary War, this is Bonne's important map of Louisiana and the British claims in North America. Covers from the Grand Banks south to Florida and westward as far as Mexico and Texas. Shows the British holdings in America at their fullest extent. Following the French and Indian War, the British laid claims to all of Canada and the entire Great Lakes region. France maintained its hold on the territory west of the Mississippi River to New Mexico. This map is extremely rich in detail offering and naming countless American Indian settlements and villages. Also names a number of early French forts and trading posts along the Missouri and other westward tributaries of the Mississippi. The Great Lakes are laid out with a close approximation of accuracy though several apocryphal islands are shown in Lake Superior. A red line just north of the great lakes marks the southernmost boundary to the lands claimed by the Hudson Bay Company. Southern Florida is drawn as an archipelago in an early attempt to depict the Everglades. Names Niagara Falls as well as numerous French forts along the Mississippi and further west. Bonne also issued a slightly earlier edition of this map in 1771 joined to an associated map of what is today eastern Canada. Drawn by R. Bonne in 1776 for issue as plate no. 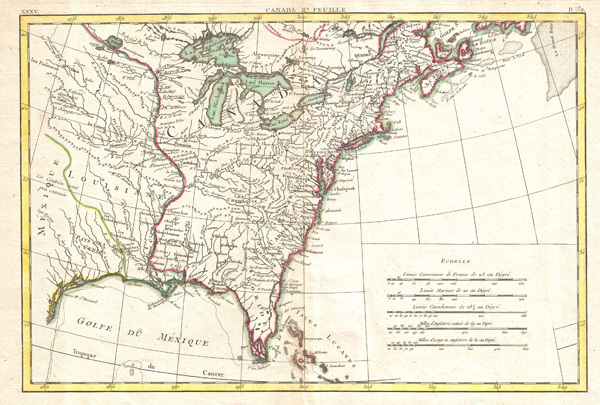 A 32 in Jean Lattre's 1776 issue of the Atlas Moderne. Rumsey 2612.071. McCorcle, B., New England in Early Printed Maps 1513 - 1800: An Illustrated Carto-Bibliography, 771.2. Kershaw, Kenneth A., Early Printed Maps of Canada, 475. Phillips (Atlases) 664. National Maritime Museum, 215. British Library, World, col. 384-385 (1762-1785 eds. ).